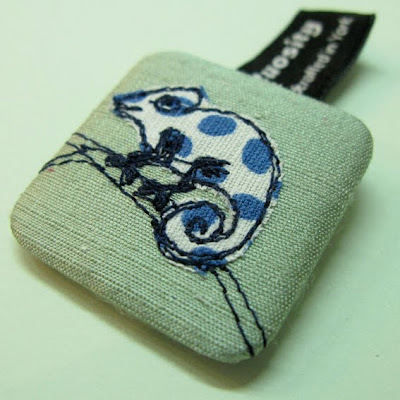 From the pavement outside the Sumptuosity shop at Walmgate, York, you can see directly into their workshop where, surrounded by silks and threads our guest, Ruth Brompton Charlesworth and her Sumptuosity team create their beautifully embroidered gift items. We asked Ruth to give us an insight into her creative process and she shared with us a glimpse into her early creative life too! 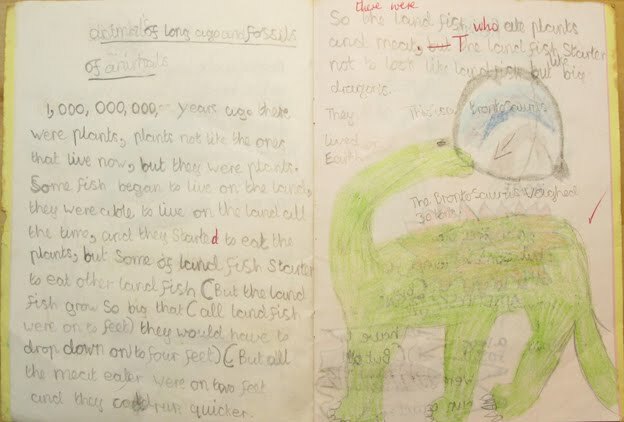 I can't remember when I first fell in love with Natural History but it must have been relatively early. 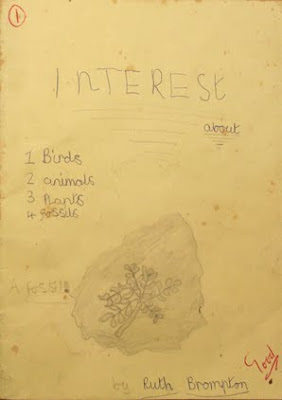 An old school book of mine titled 'Interests', lists the following items; 1: Birds, 2: Animals, 3: Plants, 4: Fossils: I must have been about 7 or 8 and I am still delighted to see that the teacher (Mrs Falgate) had written "Good" on the cover - something that rarely happened with me and school! It is full of fabulous facts (e.g. Bull Finches like Fruit Trees) and drawings, all of which are brightly coloured and I still like to work with colour except that today it isn't with coloured felt-tip pens from W.H.Smith's. Sumptuosity (the craft business that I run with my husband John) specialises in small free-hand embroidered gift items, e.g. badges (various sizes), book marks, handbag mirrors and lavender bags, which we mostly sell direct to galleries and independent shops etc, although we do also sell through our website and from our studio in York. My work for Sumptuosity is still very influenced by the natural world, as my favourite designs to embroider are flowers, birds and bugs. I am currently very lucky to be working on some new designs for the Natural History Museum in Oxford, these include Fossils, Chameleons and Dodos: Our work has to be carefully planned in order to work out the most efficient manner of making an item while balancing artistic integrity but without being commerically unviable. People often ask "how long an embroidery takes to produce"... this is a very difficult question to answer as of course it varies from design to design but what I generally tell people is that the real time is in the design process. I have to be happy not only with the final concept, I need to feel confident that I can successfully reproduce the design with my free-hand embroidery. It is important for me that the design is completely free-hand and not in anyway computer generated or from a template as I feel that the differences that occur in each piece are what makes it a joy for both the maker and the user ( to paraphrase William Morris!). At Sumptuosity, we specialise in using brightly coloured Indian handwoven dupions for the base fabrics onto which we embroider. I love the vibrant colours and the random nature of the slubs in the weft. The designs themselves are created by embroidering and appliquing vintage and recycled fabrics - many from the local charity shops here in York. 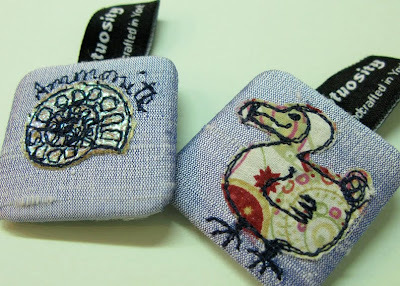 I have really enjoyed working on the Dodo, as it is one of my favourite birds, I especially love the shape of it. 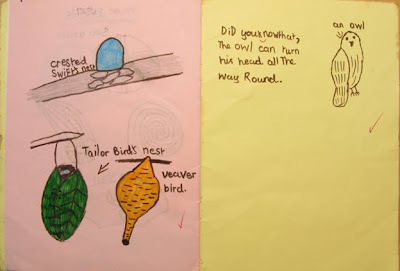 From my notebook, you can see the doodled drawings as I attempt to decide what are the key attributes of the bird and how successfully I can recreate it again and again. I originally began by working with grey silk for the Dodo's body but I wasn't happy with the look of it, even if it was technically similar to what is believed to be the bird's real appearance. Sophie (one of the young graduates who works at the Studio) came up with the great idea of simply doing what we always do at Sumptuosity, which is to use 'random' pieces of patterned fabric for the applique of a design regardless of what it actually is. The second that I tried it I knew that we had hit on the right look for the Dodo. We often work collaboratively here in the Studio (asking each other for their opinions or suggestions etc) and it makes for a happy and friendly atmosphere. Many many years later I still haven't grown up but it is wonderful to combine my love of creating things with my love for bugs, birds and flowers. Thank you Ruth , so much! You can keep up-to-date with the latest Sumptuosity plans, design ideas and day-to-day life in a craft workshop via the Sumptuosity Facebook page and Ruth's blog and, if you can't get to York to visit Ruth and the Sumptuosity in person, then indulge yourself in some 'seriously small craft' through their online store. You could even indulge someone else ... if you think you'll be able to part with what you buy! 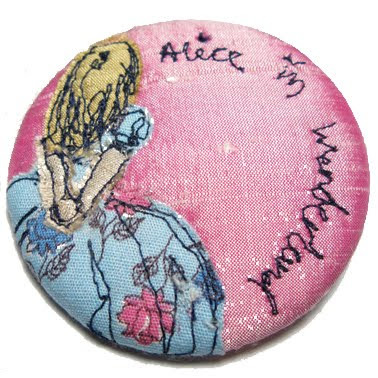 *Giveaway* Sumptuosity are offering an amzing Alice in Wonderland handbag mirror as a gift to one of you!!! then pop back here to us and leave a comment mentioning any of Sumptuosity's other products which has especially caught your eye. Carrots! Who doesn't need a brooch with a carrot on? Though I love the dodo too. The stuffed dodo in our local museum is my favourite exhibit! I love that little white/red polka dot dress button! I love the Mrs Beeton brooches! Love the cupcake brooch, but also love the bee bookmark too! I really loved the bookmarks too, but found it hard to choose a favourite but I love the snail. When I was at Uni I did illustrations for an A A Milne poem with the line 'George gave the huffle of a snail in danger'. Gorgeous pieces! I wish I had such mad embroidery skills. It's interesting to have an insight into the design process. I love love love the Alice in Wonderland greetings cards in the shop. Wish I could go through the rabbit hole to that magical land. Well, I have to say, I have a bit of a thing for handbag mirrors, and the damselfly one is stunning. This is awesome, thanks for sharing...now I'll have to #'s to $'s! Oh my goodness! We're off to York in the summer - I must find this place and visit in person! I love the limited edition stuff, esp. the Herald button badge. Just gorgeous. Wow, we are hopefully coming to York in half term so will have to come and visit this shop! So many gorgeous things but I especially love the Baah Baah Black Sheep triptych and the Painting the Roses Red brooch. I can't use a sewing machine but was inspired to do a little hand applique - thanks so much! 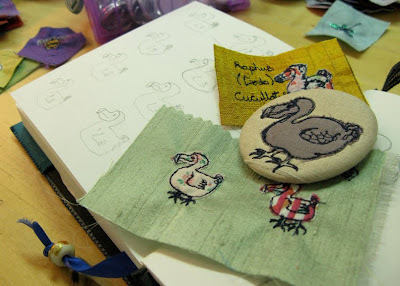 The bookmarks, especially the Quirky Bird! Oh my goodness what DON'T I like? I love the Quirkious Birdious Triptych and the Baa Baa Black Sheep one too *g* And then there's all the Alice in Wonderland stuff - the Cheshire Cat in particular. It's all just WOW! Those Tenniel inspired designs are something else. I especially love the golden key with book text behind it, just glorious.